Google Pigeon is a relatively new algorithm to be launched for the search engine. It is meant to improve the local search results. It is a well-known fact that people will usually prefer to make their purchases locally. Google, too, knows this fact. With the help of the IP address, Google can easily determine the location of the person making the search. Pigeon allows Google to show search results that are based on the location of the user. It makes it easier and faster for the user to locate what they require. The search engine algorithms designed by Google are primarily aimed at improving the user experience. They help you to find something that can be of value to you. However, the purpose of the Pigeon algorithm is slightly different. It is meant to improve the local search results. 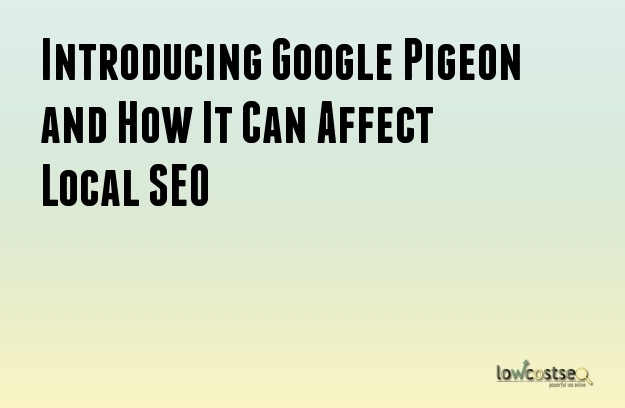 The idea behind Google Pigeon is to make the local searches more similar to the organic searches. It utilizes similar functions such as spelling correction, Knowledge Graph, synonyms. You will find that you will be shown results on businesses or other details that are related to the area you are performing the search in. Certain changes have already been noticed thanks to the introduction of Google Pigeon in the search results. They show that your SEO can be significantly improved by making use of changes brought by the Pigeon algorithm. Some of the major changes that have been noticed after the release of Google Pigeon have been mentioned below. Local business directories are bound to be benefitted from the updates brought by Google Pigeon. As Google Pigeon is meant to change the way local searches are displayed, local directories have become one of the major beneficiaries. When queries related to the local establishments are entered, you will find all related establishments such hotels, cafes and restaurants are displayed in a carousel. This is due to the Google Pigeon update. Apart from the carousel, the organic search results will showcase results from the best directory websites followed by the appropriate results from local newspapers or magazines. It is possible that the websites of the establishments in the vicinity do not get displayed in the first page of the search results. This is possible even if the businesses are actually showcased on the carousel. Without the implementation of the proper SEO techniques, you will find that the rankings of your website can vary greatly. Some websites may find that their ranks have increased automatically while others will notice a marked decrease in the rankings. It is not very difficult to gain a suitable rank after the Google Pigeon update. Certain SEO techniques which are no longer in use can now become good methods to improve the ranks of your website. Google Pigeon has certainly made it easier for the user to find businesses located in their immediate vicinity. Even businesses can make use of this update to gain actual paying customers. Below is a fantastic infographic that we found on visualstan showing how a marketer reacts to the Google Pigeon update.